Fully updated for Windows Server 2012 R2! Prepare for Microsoft Exam 70-410 - and help demonstrate your real-world mastery of implementing and configuring core services in Windows Server 2012 R2. Designed for experienced IT professionals ready to advance their status, Exam Ref focuses on the critical thinking and decision making acumen needed for success at the MCSA level. 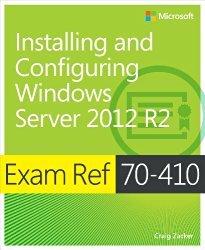 Focus on the expertise measured by these objectives: Install and configure servers Configure server roles and features Configure Hyper-V Deploy and configure core network services Install and administer Active Directory Create and manage Group Policy This Microsoft Exam Ref: Organizes its coverage by exam objectives. Features strategic, what-if scenarios to challenge you.